January 31, 2017 was a glorious day for hip hop. DRXQUINNX, Demnark Ves, and Azarias joined forces to bring us Doppelganger: a FREE six track EP featuring the emceeing of Denmark Ves and DRXQUINNX over the production of Azarias. Doppelganger is grimy and slick-mouthed; classic boom-bap knocks with a gutter soundscape feels. These Chicago-based artists really put one up for the city. 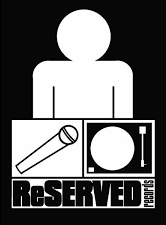 ReServed is looking forward to this new trio’s next move. This project sets up for something really promising.